Denmark’s capital, Copenhagen, is a charming and compact city that is fun for families to explore on foot. Although most people speak English, the city maintains a distinctly European feel. Here are five things to do in Copenhagen with kids. There are many tributes in Copenhagen to Hans Christian Andersen, the Danish fairy tale writer author who spent most of his adult life in the city. Best known is the Little Mermaid sculpture, which sits in Copenhagen Harbour and was gifted to the city by Danish brewer, Carl Jacobsen. The famed bronze and granite sculpture recently celebrated its 100th birthday. If you are planning to pay the world’s most famous mermaid a visit, then be sure to address expectations beforehand to avoid disappointment. Chances are the statue is much smaller than children envision and the Little Mermaid definitely doesn’t look like Ariel in the Disney version of the classic fairy tale. I had warned my then 6-year-old daughter and she did not mind the statues diminuitive size; she was just excited to pose for a photo with the mermaid. You can see the Little Mermaid either by land or from the water. We did both, stopping by to take photos with the sculpture during a Hop On Hop Off (HoHo) bus tour of the city. The following day we visited the statue during a canal cruise. This provided an interesting vantage point of all the tourists on shore taking photos of the tourist attraction. 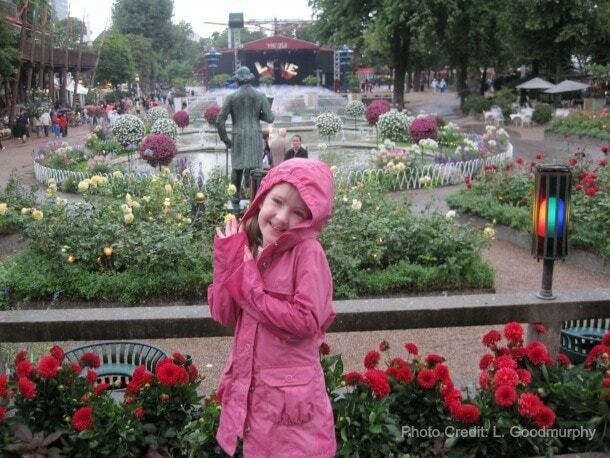 Tivoli Gardens, a popular Danish amusement park, is said to have inspired Walt Disney to build Disneyland. The charming old-style amusement park, located right in the heart of the city of Copenhagen, is a far cry from the North American parks and mega-roller coasters that most kids know. Tivoli was founded by Georg Carstensen who, inspired by his European travels, decided to establish a romantic pleasure garden in Copenhagen. When the park first opened in 1843, the only rides were a carousel and a simple roller-coaster. Today, however, Tivoli Gardens is one of the most popular attractions in Copenhagen with its 28 rides, lovely gardens, a concert hall, a theater, an aquarium and numerous eating establishments. My family visited the park on a rainy day and discovered that wet weather has advantages; there were no line-ups and we were able to enjoy the rides over and over again. A favorite was the The Flying Trunk, which rides through scenes from 32 of Hans Christian Andersen’s fairy tales, many of which I had no idea that he had authored. 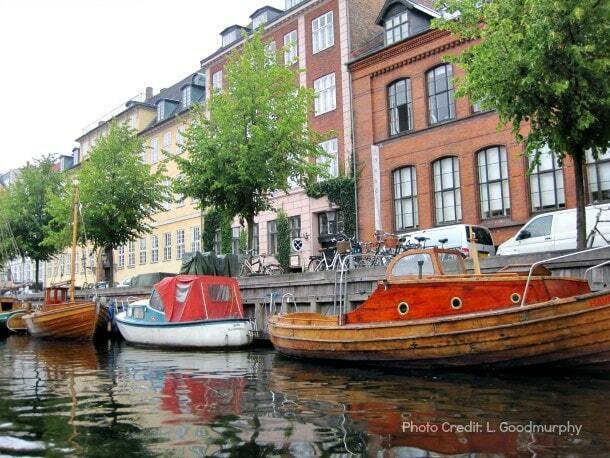 A canal cruise provides a great way for families to see the sights in Copenhagen. The view from the water is delightful and children love going for a boat ride. Tours start from the colorful district of Nyhavn (New Harbour) and wind through the canals, under bridges and out in the harbor past the Little Mermaid statue. En route, you will see the Opera House, Amalienborg Palace, and Christiansborg Palace as well as several neighborhoods. The narrated tours last about an hour and are available in English. Covered boats make a canal cruise a pleasant experience even on a rainy day. 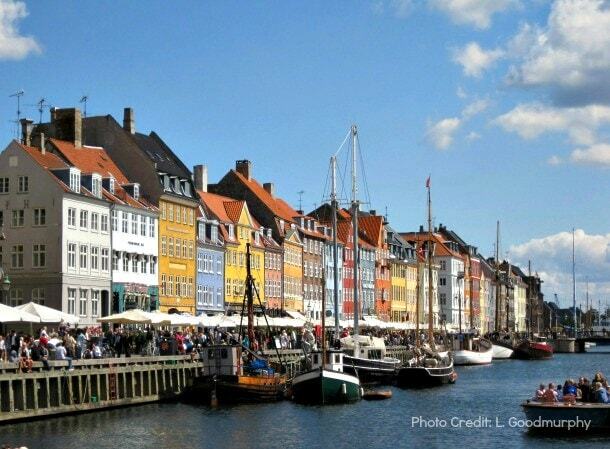 Kids who love castles, uniformed guards, kings, queens and princesses will love Copenhagen. The city is home to the world’s oldest monarchy. The guards march through the streets of Copenhagen from Rosenborg Castle before taking up their positions outside the Queen’s Residence each day at noon. The on-site museum provides a glimpse into Danish royal life. 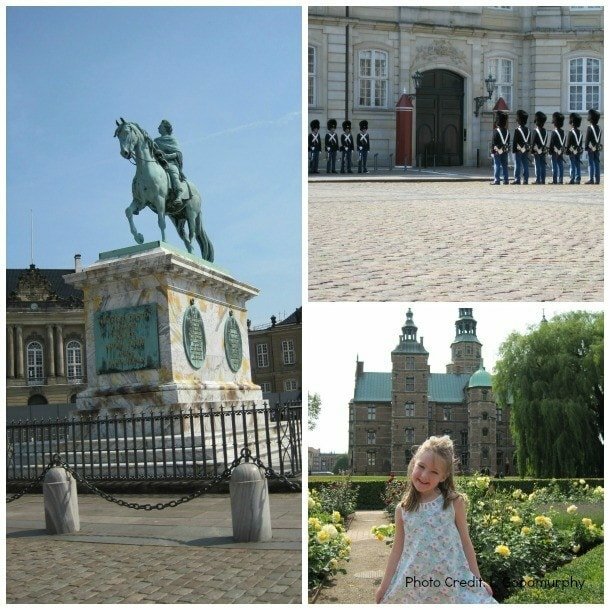 Amalienborg Palace is the residence of the Danish monarch, Queen Margrethe II. The changing of the Royal Guard ceremony can be viewed here. Kronborg Castle, just north of Copenhagen in Elsinore, is known around the world as Hamlet’s Castle. Take a peek at Denmark’s crown jewels at Rosenborg Castle. The King’s Gardens at Rosenborg are one of the loveliest places in the city to relax, take a stroll or enjoy a picnic. The Royal Stables, Queen’s Tapestries and a history of Denmark are open to the public at Christiansborg Palace. Wandering through Copenhagen’s shopping district, Strøget, is much more than a shopping excursion. More than a mile long, this is one of Europe’s longest pedestrian-only streets. Strøget is home to nearly any type of shop that you could want, including chain stores, high-end luxury retailers, Danish designers and cafes. LEGO, the beloved Danish toy maker, maintains its flagship store here, a must-see when visiting with children. The crowds are out shopping no matter the weather but when the sun is shining, expect plenty of street performers to keep the kids occupied. What would you enjoy most about visiting Copenhagen with kids? Let us know in the comments below! 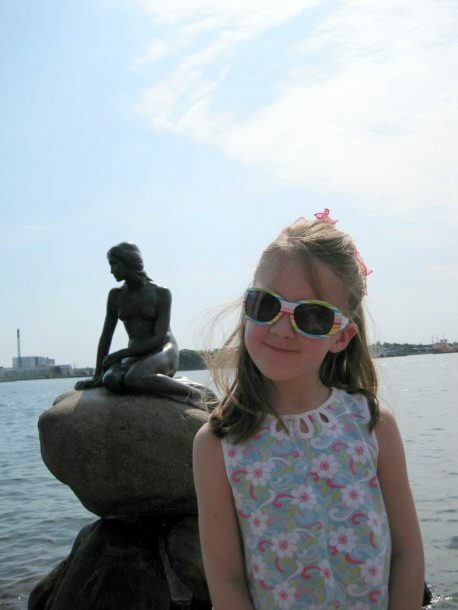 I used to travel to Copenhagen all the time for work, but I never thought of going back there with my daughter. Thanks for the suggestions. I hear they also have great family beaches. You and your daughter would have a great time in Copenhagen, Jody! Everyone in my family agrees that we would like to return to spend a few more days here. I didn’t know about the beaches – but then the weather was a bit cool and rainy when we were there. That’s something to keep in mind for the next time!! Plenty of things to do and visit in Copenhagen with or without kids! Is a beautiful city! Thank you for sharing your impressions! 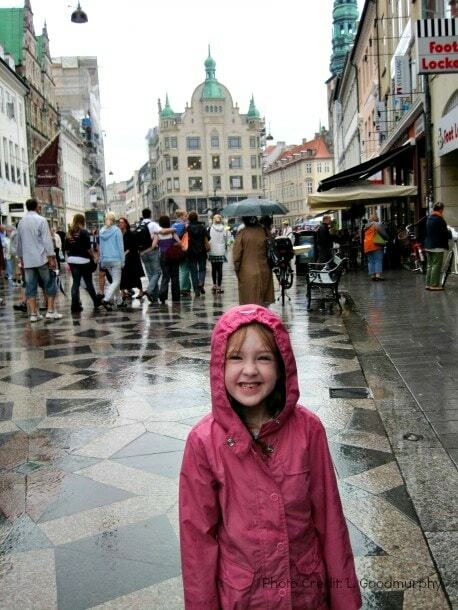 Haha cute Kid and the pictures are representing true Copenhagen, Thanks for sharing! I’d love to do ALL of those things!! Oh, the Little Mermaid! I understand it’s small, but would be a priority for me in Copenhagen.